Mene first sculpted Fabio in the early 1840s, it was done as a portrait of a favorite hunting dog. The model was so popular that Mene had it cast in 3 sizes, this is the smallest size or miniature version. The dog is a French Spaniel or a Setter, both were popular breeds at the time. 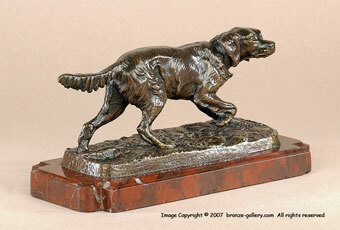 This miniature bronze has all the character of the larger versions and captures a hunting dog pointing game. It is a fine cast with good details and is mounted on the original red marble base measuring 5/8" thick by 6 5/8" long (17cm). A fine example of this classic Mene sculpture. 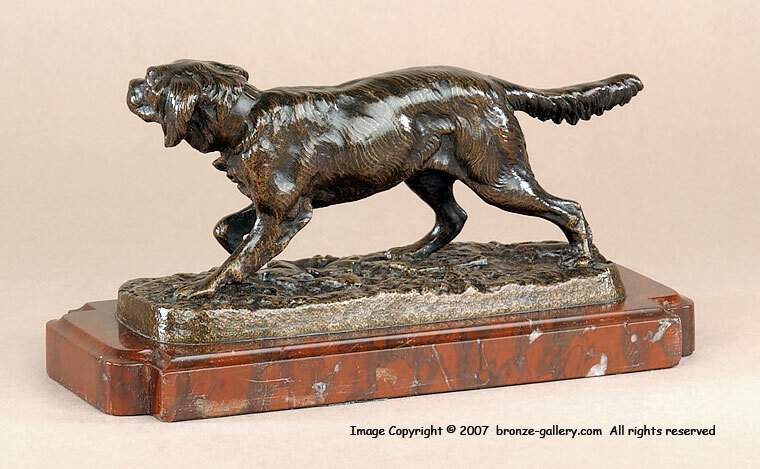 This bronze is pictured as a full page illustration in the book Les Animaliers by Jane Horswell on page 139.